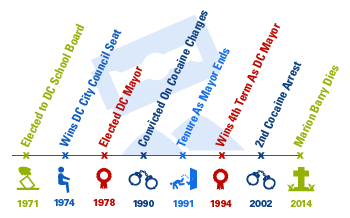 Thousands of devoted Washington, D.C. residents mourned the loss of the district’s iconic “Mayor for Life,” Marion Barry. The four-term mayor passed away at the age of 78, one day after being released from the hospital. The Washington Post states that Mayor Barry’s 40-year tenure in American politics saw many highs and lows, most notably an investigation, arrest and conviction for crack cocaine possession in 1990. The FBI caught this incident on video during an infamous sting operation. The controversial mayor was convicted, resulting in a six-month term in federal prison. This, along with his addiction, forever changed how Mayor Barry was perceived by many of his constituents. Mayor Barry’s legacy will no doubt be deeply scrutinized because of his colorful personal and public life. To many, he was the perfect example of a high-powered executive with an addiction. Some of the general public viewed him as a man who managed to rise above his substance abuse and continue his political career, although his subsequent years were tumultuous. If nothing else, his story illustrates that addiction infiltrates all areas of society: rich, poor and middle-class. Mayor Barry was born into a lower class family in rural Mississippi, the son of a sharecropper. The civil rights pioneer turned polarizing mayor of Washington, began his ascension to politics by starting on the school board. The New York Times states that Mayor Barry made his debut in Washington in the 1960’s as the president of the Student Nonviolent Coordinating Committee (SNCC). During an era where racial tensions were high, he made his presence known and fought for equality for all. During the beginning of his third term as mayor, rumors began compiling about his alleged usage of cocaine. before his arrest for cocaine possession in 1990, he convened a “D.C. drug summit” in 1986. The New York Times article ironically also stated that before his arrest for cocaine possession in 1990, he convened a “D.C. drug summit” in 1986. This involved a panel of experts discussing the cocaine epidemic in the United States. Subsequently after his arrest and incarceration, Mayor Barry was immediately re-elected into office. Despite his many trials and tribulations, many viewed him a testament to overcoming addiction. In the United States, an estimated 23.5 million citizens are struggling with drug abuse and addiction. Cocaine has been a strong presence in American society since the early 1800’s. Mainly originating in South America, cocaine has crossed the border and made its way into many households across the country. The Center for Substance Abuse Research at the University of Maryland (CESAR) explains that cocaine could be found in many products in the early 1900’s. For example, it was a common household drug, surgical anesthetic and a lead ingredient in Coca Cola. CESAR research states that cocaine is a bitter, white powdery substance that is highly addictive. 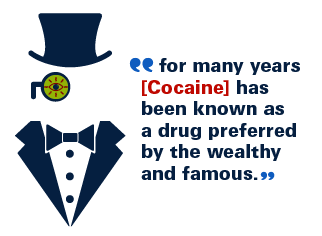 Cocaine has a powerful stimulating effect on the nervous system. As a result, it raises levels of dopamine, a neurotransmitter linked to pleasure and movement in the brain’s reward circuit. The effects generally last from 15 to 30 minutes, or only 5 minutes depending on the dosage taken. Although cocaine’s high may be fleeting, its side effects can last a lifetime often resulting in loss of smell and in severe cases, psychosis. The short-term physical effects of cocaine include constricted blood vessels, increased heart rate, temperature and blood pressure. The more of the substance that is taken, the stronger effects. After methamphetamines, cocaine causes the highest psychological dependence of any other drug. Psychology Today states that, with larger doses, the side effects are more severe. This can lead to an addict lashing out with erratic and violent behavior, paranoia and twitching may also occur. Long-term effects can also lead to cardiovascular issues such as heart attacks and strokes. After methamphetamines, cocaine causes the highest psychological dependence of any other drug. It quickly creates a high tolerance in addicts, leading them to increase dosages, which many times leads to overdose and death. Addiction can affect any person, anywhere in the world. Although the demographics of cocaine users cover a wide range, for many years it has been known as a drug preferred by the wealthy and famous. The NewDaily.com states that due to cocaine’s costs, the wealthy are more easily able to afford it. Due to celebrities and movies portraying it as a trendy recreational past time, it has a strong influence on the younger generations, enabling the social acceptance to partake in it as well. Policymakers across the country are trying to combat this by making cocaine harder to obtain and offering more treatment options for addicts. 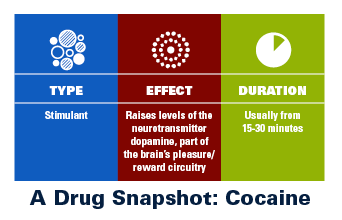 Cocaine carries with it a variety of physical, mental and emotional side effects. Addicts may seem overwhelmed at the thought of entering into a treatment program and becoming sober. However, this is the only way to successfully learn tools to cope with the addiction and achieve long-term sobriety. Seaside Palm Beach is a luxury, all-inclusive recovery destination. For addiction and mental disorders, Seaside Palm Beach has a wide variety of specialized treatment programs for patients. Our state-of-the-art facility offers a comprehensive, holistic approach to therapy. a comprehensive, holistic approach to therapy With over two decades of experience, Seaside Palm Beach has aided thousands in achieving sobriety. Our therapists educate patients with tools to use as coping mechanisms when they feel the urge to abuse a substance. We believe that one’s mind, body and spirit must all be addressed during the rehabilitation process. With industry leading success rates, Seaside Palm Beach understands that entering rehab may seem overwhelming, especially for those in high powered positions. However, our facility will assure you that sobriety is the right choice. Seaside Palm Beach understands the importance of being able to work continually during treatment. We allow the usage of electronic devices during rehabilitation so that patients can stay connected with friends, family and work colleagues. Seaside Palm Beach will put you on the path to long-term sobriety. For more information on our unique programs, please (888) 997-3274.